Detailed review of Asterwood Naturals Hyaluronic Acid Serum. See what real experts and actual users have to say about this face serum. There’s a reason Hyaluronic Acid is a main ingredient in so many anti-aging serums, and Asterwood Naturals Hyaluronic Acid gives your skin an extremely concentrated version of that. For less than $13 for an ounce, Asterwood Naturals Hyaluronic Acid serum is one of the cheapest anti-aging face serums on the market, and the results it packs are pretty impressive. Making a significant difference in fine lines, skin texture, and even dark spots, this concentrated serum delivers on its promises. Without any other ingredients to help improve skin appearance, however, Asterwood Naturals Hyaluronic Acid is lacking compared to other anti-aging serums, and is slightly more uncomfortable to wear than your average face serum. However, for someone looking for gradual skin changes at a cheaper price point, Asterwood Naturals Hyaluronic Acid is definitely a winner, and a perfect starter serum for someone hoping to invest more into their skincare routine. Asterwood Naturals Hyaluronic Acid serum has a really average face serum texture, so it’s pretty simple to incorporate into your daytime and nighttime skincare routine. Once you’ve applied the face serum, however, it is a little uncomfortable to wear. It has a stickier feeling that leaves your face with a slight tightening feeling, and makes it a little trickier to apply your moisturizer on top of. However, since the face serum is water-based, I loved that I could wear it under my makeup, because it didn’t add any oiliness to my face like a lot of face serums tend to do. Application of Asterwood Naturals Hyaluronic Acid serum is relatively simple. It’s no secret that I’m not a fan of droppers as an applicator for face serum, but about half a dropper full of serum was the perfect amount of product for my face and neck, so it was pretty simple to measure out. To use Asterwood Naturals Hyaluronic Acid, cleanse and tone your face, and then drop the product into the palm of your hand. Rub hands together and apply to your face and neck. Use both morning and night. The serum instructions say you can use this alone or with a moisturizer, but I didn’t find the serum to be moisturizing at all, and would be really uncomfortable without a moisturizer on top of it, so I wouldn’t recommend using this alone. I definitely think it needs to be an added step in your skincare routine versus replacing your face moisturizer. Asterwood Naturals Hyaluronic Acid serum dries in about 30 seconds if you use the appropriate amount of product. If you use more than half of a dropper of product, you may find that it takes closer to a minute to dry. Asterwood Naturals Hyaluronic Acid serum is completely odorless, so it’s a great fit for anyone who’s sensitive to strong scents in their products! As I do with every new face serum I try, I used Asterwood Naturals Hyaluronic Acid serum at night first. When I woke up the next morning, I didn’t see any results. I did notice that I didn’t have any added congestion or blemishes pop up, which is always a bonus with face serums, especially when trying out a new product. With this face serum, it actually took a couple weeks before I really began to see results, so I definitely think this creates more gradual changes in your skin versus immediate noticeable results. 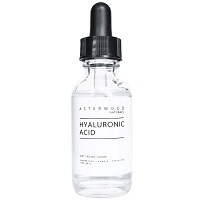 As an anti-aging serum, I think Asterwood Natural Hyaluronic Acid really does deliver on the claims it makes. The first result I noticed after daily use was a change in my dark spots on my face. They were definitely starting to lighten up to that point that a light foundation could completely cover them up. I also saw a major difference in the fine lines around my eyes, specifically in the crow’s feet area. I actually had my dermatologist comment that she’s never seen someone with so few lines on that area of the face, so that was a major confidence boost! While the anti-aging benefits were obvious, though gradual, only having two ingredients in the serum left me wanting a little more. With so many other anti-aging serums, there are added ingredients that help calm your skin, increase hydration and radiance, etc., and I didn’t get that from this face serum. I also found that this face serum took longer to show results than other anti-aging serums I have used in the past. At $12.90 for an ounce of product, this is absolutely worth the money! I’m pretty surprised that I got the results I did with how little I paid for the serum, and I really did see differences in my skin! Asterwood Naturals Hyaluronic Acid serum is the perfect starter serum for someone who wants to invest more in their skincare routine but isn’t quite sure where to start or how their skin will react to a face serum. For someone who has been using face serums for a while and is looking to further increase the appearance of their skin, there are better choices out there at a slightly higher price point. Asterwood Naturals doesn’t have any information on their website regarding money back guarantees or returns, which I think is super weird. I’ve never seen a website with such little information, actually. So I think that’s a little concerning/weird. To purchase Asterwood Naturals Hyaluronic Acid, click here. Application Apply twice daily on cleansed, toned skin. Can be used alone or with a moisturizer after application.